Information Printed Automatically in Book Form by Personal Ancestral File, a free program of The Church of Jesus Christ of Latter-day Saints. My family collected information on the Barefoots ever since my Grandmother Ella Krise Hammer was a young girl. It was continued by my mother Elizabeth Mae Krise, then by my sisters and me ~ Eleanor, Betsy, Sylvia ~ and even by my niece Vicki Erdley and my nephew Mark Hott. There are a number of contemporary experts on the Barefoot Family. To name a few are Sylvia Coleman and Gary Mickle, authors of the Barefoot book, Becky Barefoot at http://www.beckfoot.info/, and Sharon Sheldon, who generously shares her research finds with all of us. Modified Register for James Barefoot Larger copies of the photos are available by purchasing the book on James and Mary Barefoot. Contact Sylvia Coleman, scmishka@aol.com. Do not copy the above photo collage without permission. 1. James Barefoot was born on 20 May 1788 in ,Lancaster, Berks, or Chester , Pennsylvania, United States. He died on 13 May 1844 in St. Clair Twp. , Bedford, Pennsylvania, United States. He was buried in Quaker Cemetery, East St. Clair, Bedford, Pennsylvania, United States. James married Mary Sleek/Slick, daughter of Sgt. William Slick and Rebecca Mettler in 1810 in St. Clairsville, Bedford, Pennsylvania, United States. Mary was born on 11 Oct 1791 in , Frederick, Maryland, United States. She died on 28 Jul 1885 in Pleasantville, Bedford, Pennsylvania, United States. She was buried on 29 Jul 1885 in Pleasantville Cemetery, Bedford, Pennsylvania, United States. 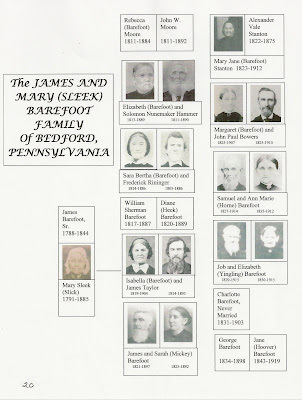 2 F i. Rebecca Barefoot was born on 3 Mar 1811 in St. Clairsville, Bedford, Pennsylvania, United States. She died on 23 Jul 1884 in W. St. Clair Twp., Bedford, Pennsylvania, United States. She was buried in Pleasantville Cemetery, Pleasantville, Bedford, Pennsylvania, United States. Rebecca married John W Moore son of James Moore and Ann Winegardner on 6 Aug 1833 in , Bedford, Pennsylvania, United States. John was born on 11 Nov 1811 in St. Clair Twp., Bedford, Pennsylvania, United States. He died on 25 Feb 1892 in Of Pleasantville, Bedford, Pennsylvania, United States. He was buried in Pleasantville Cemetery, Pleasantville, Bedford, Pennsylvania, United States. 3 F ii. Elizabeth Barefoot was born on 18 Feb 1813 in St. Clairsville, Bedford, Pennsylvania, United States. She died on 17 Sep 1889 in Jenner Township, Somerset, Pennsylvania, United States. She was buried in Jenner Twp. Baptist Cemetery, , Somerset, Pennsylvania, United States. Elizabeth married Solomon Nunemaker Hammer,son of Jonas Hammer Jr and Mary Elizabeth Nunemaker on 11 Sep 1834 in Jennerstown, , Somerset, Pennsylvania, United States. Solomon was born on 14 Dec 1812 in Jennerstown, St. Clair Twp., Bedford , Pennsylvania, United States,USA. He died on 13 Feb 1890 in Jenner Township, , Somerset, Pennsylvania, United States. He was buried in Jenner Twp.Baptist Cemetery, , Somerset, Pennsylvania, United States. 4 F iii. Sarah Bertha Barefoot was born on 14 Oct 1814 in Dunning's Creek, Bedford, Pennsylvania, United States. She died on 13 Mar 1879 in Paint, , Somerset, Pennsylvania, United States. She was buried in Davidsville Union Cemetery, Somerset, Pennsylvania, United States. Sarah married Frederick H Rininger, son of George Rininger and Mary Hine on 11 Sep 1834 in Paint Twp., Somerset, Pennsylvania, United States. Frederick was born on 23 Feb 1805 in St. Clair Twp., Bedford, Pennsylvania, United States. He died on 21 Dec 1886 in Paint Twp, Somerset, Pennsylvania, United States. He was buried in Davidsville Union Cemetery, Somerset, Pennsylvania, United States. 5 M iv. William Shurden Barefoot was born on 26 May 1817 in Dunning's Creek near Pleasantville, Bedford, Pennsylvania, United States. He died on 4 Feb 1887 in W. St. Clair Twp., Bedford, Pennsylvania, United States. He was buried in Pleasantville Cemetery, Pleasantville, Bedford, Pennsylvania, United States. William married Dianne Heck in 1843 in , , Pennsylvania, United States. Dianne was born on 21 Jan 1820 in , , Pennsylvania, United States. She died on 27 Mar 1889 in , Bedford, Pennsylvania, United States. She was buried in Pleasantville, Bedford, Pennsylvania, United States. 6 F v. Isabella Barefoot was born on 8 May 1819 in Gordons Creek, Barefoot Hollow, Alum Bank, Bedford, Pennsylvania, United States. She died on 16 Nov 1902 in New Paris, Bedford, Pennsylvania, United States. She was buried in New Paris Evangelical Cemetery, Napier Twp., Bedford, Pennsylvania, United States. Isabella married James Taylor,son of Jacob Taylor and Susan Bushman in 1840 in Est., Bedford, Pennsylvania, United States. James was born on 14 Feb 1814 in Bedford, Pennsylvania, United States. He died on 18 Oct 1893 in Chestnut Ridge, Bedford, Pennsylvania, United States. He was buried on 21 Oct 1893 in New Paris Cemetery, Napier Twp., Bedford, Pennsylvania, United States. 7 M vi. James Barefoot, Jr., was born on 14 Mar 1821 in Barefoot Hollow, Alum Bank, Bedford, Pennsylvania, United States. He died on 30 Aug 1897 in Pleasantville, Bedford, Pennsylvania, United States. He was buried in Pleasantville Cemetery, Pleasantville, Bedford, Pennsylvania, United States. James married Sarah J. Mickey on 5 May 1846 in Est., Bedford, Pennsylvania, United States. Sarah was born on 30 May 1823 in Ligionier, Westmoreland, Pennsylvania, United States. She died on 30 Oct 1890 in Pleasantville, Bedford, Pennsylvania, United States. She was buried on 2 Nov 1890 in Pleasantville Cemetery, Pleasantville, Bedford, Pennsylvania, United States. 8 F vii. Mary Jane Barefoot was born on 14 Feb 1823 in Gordon's Creek, Barefoot Hollow, Alum Bank, Bedford, Pennsylvania, United States. She died on 23 Aug 1912 in Davidsville, Conemaugh Twp., Somerset, Pennsylvania, United States. She was buried in Hopewell Methodist Church Cemetery, Boswell, , Somerset, Pennsylvania, United States. Mary married Alexander Vale Stanton, son of Stephen Stanton and Jane Vale in 1842 in Est., Bedford, Pennsylvania, United States. Alexander was born on 25 Jan 1822 in ,, Delaware, United States. He died on 11 Mar 1875 in Est. Davidsville, Conemaugh Twp., Somerset, Pennsylvania, United States. He was buried in Hopewell Methodist Church Cemetery, Boswell, , Somerset, Pennsylvania, United States. 9 F viii. Margaret Barefoot was born on 10 Mar 1825 in Gordon's Creek, Barefoot Hollow, Alum Bank, Bedford, Pennsylvania, United States. She died on 24 Jun 1907 in Anthon, Woodbury, Iowa, United States. She was buried in Peiro-Bethel Cemetery, Peiro, Grant Twp., Woodbury, Iowa, United States. Margaret married John Paul Bowers, son of Bowers and Mrs. Bowers in 1846 in , Bedford, Pennsylvania, United States. John was born on 18 Apr 1825 in , Bedford, Pennsylvania, United States. He died on 27 Dec 1910 in Little Lake, Mendocino, California, United States. He was buried in Bethel Cemetery, near Peiro, , Iowa, United States. 10 M ix. Samuel Barefoot was born on 8 Jun 1827 in Gordon's Creek, Barefoot Hollow, Alum Bank, Bedford, Pennsylvania, United States. He died on 14 Jun 1914 in Pleasantville, Bedford, Pennsylvania, United States. He was buried in Pleasantville Cemetery, Bedford, Pennsylvania, United States. Samuel married Ann Marie Horne, daughter of Andres Horne and Elizabeth Tipton on 22 Oct 1857 in Buckstone, , Somerset, Pennsylvania, United States. Ann was born on 23 Aug 1835 in , Bedford, Pennsylvania, United States. She died on 17 Feb 1912 in Pleasantville, Bedford, Pennsylvania, United States. She was buried in Pleasantville, Bedford, Pennsylvania, United States. 11 M x. Job or Jake Barefoot was born on 9 Jun 1829 in Gordon's Creek, Barefoot Hollow, Alum Bank, Bedford, Pennsylvania, United States. He died on 28 Dec 1915 in ,Bedford, Pennsylvania, United States. He was buried in Pleasantville Cemetery, Bedford, Pennsylvania, United States. Job married Elizabeth Yingling, daughter of Jacob Yingling and Susan Burk on 2 Feb 1860 in , , Pennsylvania, United States. Elizabeth was born on 11 Jun 1830 in Greenfield Twp., Blair, Pennsylvania, United States. She died on 24 Mar 1915 in , Bedford, Pennsylvania, United States. She was buried in Pleasantville Cemetery, Bedford, Pennsylvania, United States. 12 F xi. Charlotte Barefoot was born on 16 Mar 1831 in Barefoot Hollow, Alum Bank, Bedford, Pennsylvania, United States. She died on 28 Feb 1903 in ,Bedford, Pennsylvania, United States. She was buried in Pleasantville Cemetery, Bedford, Pennsylvania, United States. 13 M xii. George W. Barefoot was born on 17 Apr 1834 in Gordon's Creek, Barefoot Hollow, Alum Bank, Bedford, Pennsylvania, United States. He died on 9 Jul 1898 in Alum Bank, Bedford, Pennsylvania, United States. He was buried in Clark Cemetery, St. Clair Twp., Bedford, Pennsylvania, United States. George married Jane Hoover in 1881 in , Bedford, Pennsylvania, United States. Jane was born in Sep 1843 in , Bedford, Pennsylvania, United States. She died on 19 Jun 1919 in , Bedford, Pennsylvania, United States.